French police have used teargas and water cannon on migrants during clashes in the infamous Jungle refugee camp in French port of Calais on Tuesday night. Tensions on previous nights led to dozens of injured officers. "Two hundred and fifty police officers, of which the majority were CRS [riot police], were mobilized Tuesday" to end the disturbances around the migrant camp, said Interior Ministry spokesman Pierre-Henry Brandet, as cited by AFP. The most violent clashes took place on Sunday night. At least 26 officers were injured in stand-off with refugees who were throwing rocks at them, Gilles Debove, from the Calais branch of the SGP Police-Force Ouvrière union told the Local. AP, however, said that 27 officers were injured in clashes, with 11 on early Tuesday. France TV reported 28 injured police. According to aid workers and volunteers at the camp, police fired tear gas at refugees who were throwing rocks at them. 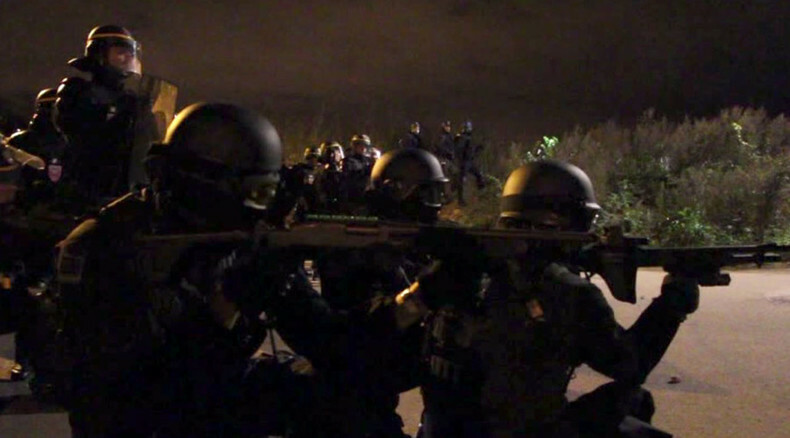 Clashes continued on Monday night between police and migrants. Local authorities were closing and opening the access to the port during the night for several times. On Tuesday morning about 200-250 migrants surged onto the Port ring road to try to block it. Some of the refugees were seen throwing rocks at police officers. “We are no longer dealing with nice migrants, but with troublemakers… Attacks against road users cannot be tolerated, because these are our clients…If this degenerates to guerrilla warfare, the reputation and turnover of the port of Calais will be hit,” he added. Many local people in Calais say they are not comfortable living in such a neighborhood. About 4,500-6,000 migrants are currently living in Jungle temporary camp for refugees in Calais. "We no longer feel at home - we live with our windows and shutters closed. We cannot even go into the garden with our children,” local resident Sandy told AFP. One more resident described to France TV the atmosphere of the recent nights filled with clashes. “We heard a big boom. We were awakened by the noise. My kid started to cry. Then we …saw all the flashing lights..... They [migrants] began to throw stones that landed in my yard, my house. It was war! " According to head of the Pas-de-Calais region Fabienne Buccio told a press conference, the migrants whose desired destination is the UK "often entered the property of local residents to obtain objects that can be used to block the trucks on the ring road" leading to the port. Calais is a popular destination for migrants who want to try their luck at illegally entering England via the Eurotunnel. More than a dozen migrants have been killed near the tunnel since June while trying to cross the border. The influx of refugees has been blamed on higher security measures that are making it more difficult for migrants to cross the English Channel and enter the UK. Most of the people living at the camp say they have fled conflicts in the Middle East or Africa.